A 22-year-old man, identified as Chika Alex-Chukwuezie, today committed suicide in Ubaekwem community in Ihiala Local government area of Anambra state. 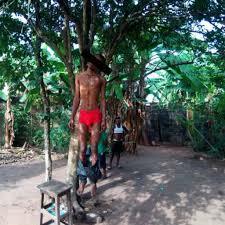 Chika Alex-Chukwuezie is said to be an active youth in the Umuezekwe political ward of Ihiala LGA, was found in the early hours of today dangling from a mango tree. The reason for committing suicide is yet unknown.